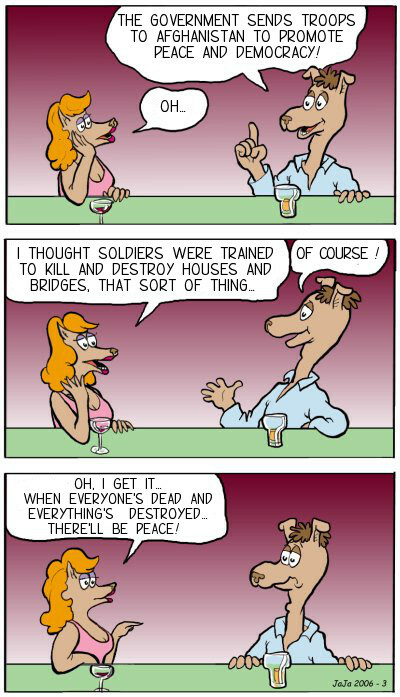 This entry was posted in comics, Jan the Stripman and tagged cartoon, comic strip, comics, politics, stripman, war and peace, webcomic by stripman. Bookmark the permalink. Democracy and Christianity or die. USA casualties in Iraq/Afg – over 6,000 dead, 70,000 returning amputees, and over 300,000 with chronic mental and physical disease. Feel any safer?Afg produces 70% worlds opium. Heroin profits have tripled. Feel any safer ? Naughty naughty deconstructing the reasons for the military presence in Afghanistan. Lol!!! Very astute cartoon! Tja, wat in de naam van vrede of democratie wordt gedaan is meestal niet te begrijpen! We always knew there was a logical reason behind war!! !